Because a water line is pressurized, it will leak water continuously 24 hours a day, 7 days a week. Not only does this create a very high water bill, but it can also undermine the integrity of your property's concrete slab over time. That's why it is so important to fix these leaks as soon as possible. Many times, a high water bill, a warm spot on the floor, or water seeping through a crack in the concrete is the first indication of a water line leak. Because these leaks are underground, and often under concrete or asphalt, slab leak detection is the only way to find such leaks. 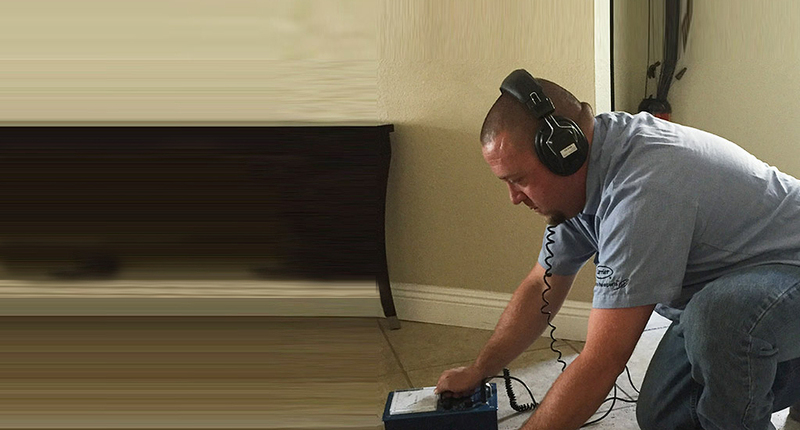 Slab leak detection uses an electronic device that is extremely sensitive to subsonic sounds, making it possible to determine the exact location of a slab leak without digging up the entire property. State-of-the-Art Electronic Leak Detection Equipment. Experienced, Licensed Plumbers. At Steve's Service, we've made it our mission to be the leading provider of slab leak detection services in the San Bernardino County area. Not only do we have some of the most skilled and experienced plumbers in the area, but we also routinely upgrade our slab leak detection equipment to keep up with this constantly-improving technology. By doing so, we give our clients the best chance at finding even the most difficult of leaks and obtaining the most accurate information on the leak's location and depth. Once the location of the leak is known, we'll help you determine if you would be better served with a pipe repair or a pipe reroute. For a pipe repair, because we know exactly where to dig, we'll be able to minimize the entrypoint needed to access your pipe, saving you money on the repair itself as well as the post-repair reconstruction. If your leak is directly underneath expensive flooring or hardscaping, then a pipe reroute is often best. With a reroute, we will replace all or a portion of your water line with your choice of piping. We can install all new copper pipes or a hybrid system that features a combination of copper and PEX. Our new pipes come with a 20-year parts and labor warranty--the best in the industry--and always meet or exceed state building codes. Both of these slab leak repair methods are insurance approved. Call today to learn more or to schedule slab leak detection. Steve's Service is family owned and operated, and fully licensed and insured.